The first book that I read by Sue Miller – While I Was Gone – I loved. I even really liked Lost in the Forest. But The Senator’s Wife I just flat out didn’t like. I can’t say that it did nothing for me, because in fact, by the end, I was shouting back at the CD player in my car. And, this may be the one book I liked the least that I have the most to say about. 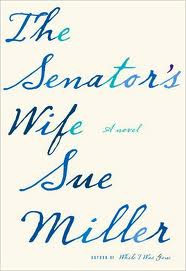 In The Senator’s Wife, Miller takes a not-so-coincidental look at what it might look and feel like for the wife of a cheating husband who happens to be a well-known politician. The wife, Delia, stands by the husband, Tom – despite repeated public offenses, despite their children’s protests, despite, despite, despite. They do privately separate – he maintains their Washington apartment; she gets the duplex in a yuppie New England college town and a flat in Paris where she spends two months a year. And for more than 20 years, this is how they live. However, unbeknownst to their children, they maintain continual (if not sporadic) intimacy. Meri and Delia become friends, and at first it seems they are going to help one another grow past what they can’t see for themselves. But it just doesn’t happen. No character changes. Meri has a child, risks her new found and rewarding career, and stands by in silence as Nathan complains to a female co-worker about how the timing of the baby isn’t good for his career. Nathan doesn’t grow up. Tom has a debilitating stroke and Delia the Martyr welcomes him home as his caregiver. (“We are still married,” she insists to her children.) Tom, even in his convalescent state, doesn’t change. I just don’t get Delia – and maybe that is Miller’s point, we aren’t supposed to. In so many ways she’s an educated, liberated woman. But she is so in love with a man who obviously doesn’t love her in the same way. It is even too flip to say he “uses her.” I think there is some truth to Delia’s insistence that Tom loves her, he just “can’t” be faithful to her. But I stand by an old adage I’ve offered to more than one friend – people treat you exactly how you allow them to. Even when Delia feels she has ultimately ‘won’ with Tom, that she has him and there is no way for him to betray her ever again (spoiler alert) he does. I think it is fair to say Meri regresses as a character. And while there is no mistaking her betrayal of Delia, I actually feel Delia’s treatment of Meri is unfair. Ultimately she holds her friend to a higher standard than she does her husband. So as much as I was put out with both of these lead characters, there is much to discuss here. What truth does Miller reveal about the nature of women? I like to believe that we are much more faithful to ourselves and our friends than she offers. But, I’m curious to know what others think who have read this one. Let’s discuss. I completely agree with you on this one. This book and the women in it annoyed me greatly. I just can’t see repeatedly letting a husband cheat on you (in many different ways) and not have something to say about it. Great review – thanks! I enjoyed hearing that your mom’s reaction to The Double Bind was similar to mine and came by to tell you. Now I have to comment that I also thought The Senator’s Wife was dreadful! Blech!